The BMW S1000R is one of the most sophisticated naked sports bikes in the world. Launched internationally at the end of last year, the bike is based on the company’s highly successful fully-faired superbike, the S1000RR, that made it début four years ago. The S1000R shares the same in-line four engine and perimeter frame as the Superbike, but while the S1000RR is a track-focused motorcycle, its naked twin has been developed essentially for the road and can be equally crafty on the racetrack, though not as aerodynamic. 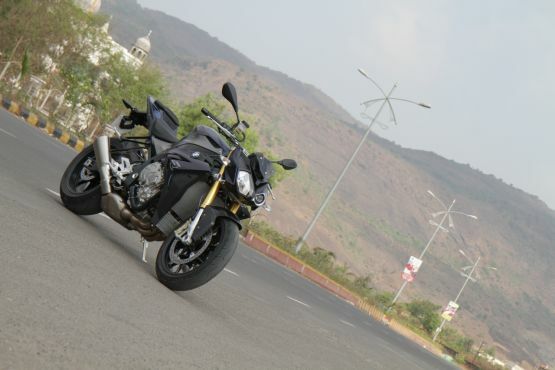 BMW Motorrad’s Indian importers and dealers, Navnit Motors, have launched the S1000R in India and they invited us to Mumbai to experience the bike. Unlike other BMW nakeds, the S1000R is an extremely compact motorcycle, though it is one millimetre longer, 19 mm wider and 90 mm taller than the S1000RR. BMW have increased the rake angle by 0.6 degrees, so the wheelbase is longer by 25 mm for better straight-line stability while the saddle height has been lowered by six mm. It has a sharp tail-up-nose-down design that more or less resembles the S1000RR’s if you don’t consider the fairing, of course. 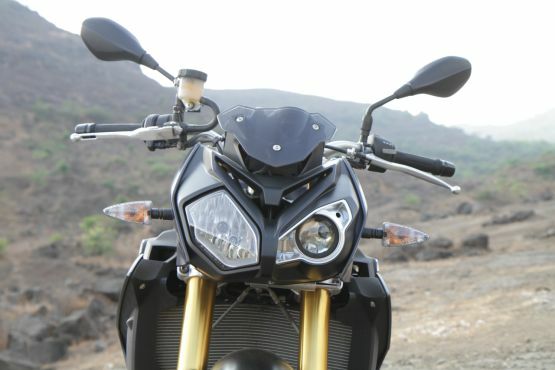 However, BMW have carefully designed the side shrouds and the asymmetric twin headlamps to ensure that the S1000R looks as quirky as its faired sibling. There is a dummy V-shaped vent above the headlamps and a small deflector covers the meter console. The functional air-intake vents are located on both sides of the tank and have rubber slits that look like gills. The meter console has an analogue tachometer dial while rest of the information is displayed on the adjoining digital screen. The bike looks exotic thanks to BMW’s unwavering attention to detail. Each and every component of the motorcycle has the highest build quality and their fit-and-finish and texture is equally tasteful. Apart from the matte blue colour of our test bike, the S1000R is also available in glossy white or red. And the ‘S1000R’ decals are placed on the tank of the red bike instead of the side shrouds as on the other two.